We are amalgamating all our family history enquiries onto this page so that they are easier to find. If you have a family history enquiry please ask via the Contact Us page and we’re happy to post them here. You will need to supply an email address with your enquiry so that people can contact you directly. Please let us know if you get any useful information! Hi, I believe my great grandfather was the railway crossing keeper at Brook Bridge, and lived in the cottage there. His wife was Mary, they had several children, the eldest John Joseph was killed in the great war, and is named on the memorial in the church. This seems to be the only evidence of an Abberley in Kingsland! I have scoured the churchyard for George Henry or Mary Abberley, without success! Just wondered if there are any Taylors in the area that have family from the area going back to the early to mid 1800s ? My 5th Great Grandfather was a William Taylor born around 1745 (not sure where). He died 1829 Kingsland. He married a Mary Lawrence born around 1751 (not sure where) and died 1828 in Kingsland. I have their son, my 4th Great Grandfather being John Taylor born 1791 in Kingsland and he passed in 1869 Newtown Leominster. He married twice, a Martha who died about 1830s I think, and he then remarried an Ann Palmer I believe. He had 9 children I believe between the marriages. He owned land I believe. But I thought maybe as Kingsland is such a small place, back then too, maybe someone might recognise or be able to help. My Great Grandfather and Grandmother (Henry and Adelaide Saxon) lived at the Rosery, Kingsland in 1917. This address appears on correspondence at the time of the death of one of their daughters, Ethel, when she was a nurse during WW1. I was wondering whether The Rosery still exists or whether the Saxons left any impression on Kingsland. Any help from current residents would be most appreciated. Reading the info on Bullocks Mill from Bob Jenkins who is my cousin, I would like to contact him. I too spent many happy times at the crossing with Bob and his family. A request for some Family History help from Michael Thomas. For more information on Sarah Knill please see Railway Reminiscences under Kingsland History. Please contact Michael directly if you can help! Sara Knill who was the railway gate keeper at Waterloo Mill, and she was step mother to my aunty, Annie Bernice Knill. Her mother was Annie Matthews who was born 1890/91 in Kingsland and died very soon after having my aunty. Annie Matthews married Willian Knill in 1917 and died in 1920. I cannot locate Annie Matthews’ mother or father in Kingsland at the present so can anyone help? William Knill worked at Stagbatch Farm, Monkland before working for the railway and marrying Sara Preece. At some point Speakmans of Stagbatch Farm, Monkland brought up Annie Bernice Knill from very young. Alison would like to say thank you to the kind people of Kingsland who replied to the post below, through whom she has found out lots of information about her great great grandfather, the blacksmiths and even better, discovered a relative in Kingsland who she has now been to visit! Thanks everyone! on a map? His name was George Davies. I am researching the names on a memorial in Liverpool Cathedral to 20 nurses who died during WW1. One of these is Staff Nurse Ethel Saxon, who died aged 26 years on 3rd September 1917 and her grave is in Karachi Cemetery. I have established that at the time of her death her parents, Henry and Adelaide Saxon, lived in “The Rosery”, Kingsland, Herefordshire, having previously lived in Abertillery and Abersychan. In addition to Ethel, they had at least one other child, Lucy, born in about 1896. I would be grateful for any information which you can provide about the family. I should add that the research is for a non-profit project on behalf of the High Sheriff here in Liverpool. Hello. I am mailing you more in hope than anything. Part of my fathers family, Frederick Faulkner, his wife Sarah and seven children (circa 1912), moved to Skelmersdale, Lancashire just before WWI. The rest of the Faulkners stayed in Kingsland. They were blacksmith/farriers by trade and the majority of the family line stayed put. They were a large family who lived and worked in Kingsland for generations. We are now trying to see if any relatives live in the area? Me and my brother are planning a visit to see where dad’s mother’s family originated. The Faulkners of Kingsland? I hope that you can shed some light on this for me? I am writing a book about a man called William Thomas Vincent, who was a very prominent gentleman in my area of south east London. His mother was Rebecca Jackson, born about 1810 in Kingsland who married Thomas Vincent. 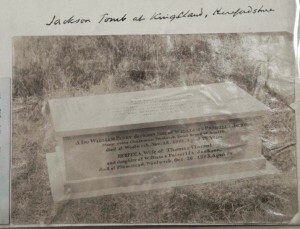 Rebecca Jackson’s parents were William and Priscilla and the picture is of their grave in Kingsland. I wonder if it is still there ? The only details I can find out about Rebecca Jackson online is that she is said to have come from a very well to do Kingsland family, and that she had an older brother called William Parry Jackson. In a very brief autobiography of William Thomas Vincent that I found he describes his mother’s family as follows…. “The Jacksons were an old Herefordshire family who came across the Welsh border in Tudor times. my grandfather William Jackson succeeded to a long and prosperous inheritance of husbandry in the parish of Kingsland. He was reckoned a very able man in those parts and was rather proud of being acclaimed the village lawyer, in which capacity he arbitrated in many disputes. He had a numerous family which he reared with credit. In his old age, the patriarchal Jackson abandoned the dwindling industry of the field and retired to Leominster. Any information would be much appreciated…. I am tracing my family history in Herefordshire and wish to enquire if you have any records (or knowledge) of a crossing on the line between Kingland and Leominster where a family member – James Andrews – lived at the time of the 1891 census. The copy of the census is of poor quality and his occupation is unclear but his wife Mary is described as a railway gate keeper. In a later census he is described as a railway pensioner. The address is shown as Railway House Kingsland. All I know at present is that James Andrews was a railway pensioner and had retired by the 1911 census (he died in 1913 age late 70s). His wife at the time – I believe he had been married before – was Mary, possibly nee Preece. In the 1891 census his birthplace is shown as Orcop; he was 55, Mary 65 and there was an 8 year old granddaughter Mary Elizabeth, born Kingsland, living with them. There was a marriage between a James Andrews and a Mary Preece registered in Leominster in 1877. The father of James was William Andrews and the family lived in Much Birch early 1800s. I would be very grateful for any help or advice anyone can give. Thank you. My Great Great Grandfather (Thomas Crump) emigrated to Australia with his family in 1850. His father (John and, after his death in 1855, wife Elizabeth) were publicans of the Lion (aka Red Lion) Inn, Kingsland for many years. I have traced this inn in Kingsland from 1835 when the publican was John Crump, through various innkeepers (Elizabeth Crump 1856, John Bray 1868, William Reece 1876, James Reece 1890 and Elizabeth Evans 1913) but can find no information about what happened to it. Hopefully one of your readers may be able to shed some light on it for me. I can be contacted by email at garyladiges@optushome.com.au or by ordinary mail at Gary Ladiges, 62 Lincoln Rd, Croydon, Vic, 3136, Australia. For those of your readers who may be interested in Thomas Crump’s story he was born in Kingsland about 1819 to John Crump (of Brampton Bryan) and Elizabeth (nee Wollaston), the daughter of an innkeeper from Leintwardine. His story can be read here but the 1841 census shows Thomas and his brother John living with the local blacksmith Thomas Caldicourt and his wife Sarah. Also as part of the household were Thomas Caldicourt’s widowed daughter Sarah Harper and her daughter Eliza. On 23 Jan 1842 Thomas married Sarah Harper (13 years his senior) and they set about raising their family. On the 21 May 1850 Thomas and Sarah and their 4 surviving children (Edwin (my Great Grandfather), Angelina, Isaac and Amelia) and step daughter Eliza Crump (Harper) set sail for Port Phillip (Melbourne) aboard the Bernicia. Whilst Thomas’s story ended in Australia it started in the Red Lion in Kingsland. Any information about the Red Lion or anything else in the attached article your readers may have would be much appreciated.